At First Cut, customer service excellence is the underpinning operational ethos. As part of this, the company’s consumables division recently hosted a technical visit by Luca Dreossi, Sales and Technical Support: Julia Utensili S.p.A., one of First Cut’s European principals. First Cut is a leading South African distributor of cutting consumables and capital equipment, while Julia Utensili is one of Europe’s foremost circular saw manufacturers, producing solid carbide saws, carbide-tipped circular saws for cutting non-ferrous metals and steel; as well as ‘dry cut’ saws for use on dry cutting machines. Julia is also a global leader in the production of circular knives for cutting a range of materials, such as cloth, leather, paper, cardboard and rubber. The key purpose of Dreossi’s visit was to assist a First Cut customer in finding the most appropriately tailored solution for their particular cutting application. Dreossi explains that while Julia Utensili is constantly developing new products, they have recently developed a new blade called the ‘Iron Lady’. This new product is completely different to Julia’s standard blades, as the steel, blade coating and the process used to produce it are all highly advanced. “The Iron Lady is an innovative circular saw blade combining the toughness of steel with the performance of carbide. This results in even higher standards of hardness, toughness, finish and durability – not to mention best cost-per-cut,” Dreossi explains. This extra fine-grained high-speed steel (HSS) blade has hardness values above 900 HV (Vickers hardness rating). The efficiency of the blade is enhanced by a multi-layer physical vapour deposition (PVD) coating with a surface hardness of more than 3650 HV. The innovative production process allows for very tight manufacturing tolerances, while the teeth have a specific profile designed for high-performance cutting. Julia’s vast pool of cutting technology combined with practical experience in heat treatment has allowed it to develop, in conjunction with a technical university, an innovative heat-treatment process. “This creates a steel microstructure with particularly high performance and resistance to wear caused by friction, or thermal and mechanical stress,” continues Dreossi. 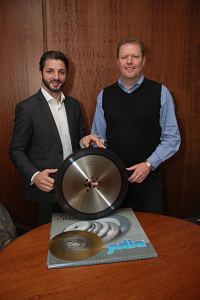 “However, the Iron Lady is only one of many blades that Julia Utensili offers to the professional industrial market. There are countless types of material such as steel, alloys, wood and plastic – to name only a few – which our customers need to cut. For each of these applications, Julia has developed a blade to do so, as accurately and efficiently as possible,” comments Gary Willis, Director at First Cut responsible for the consumables division. He explains that another reason for the excellent performance of Julia blades lies in the coatings which the blades are given. These complex chemical coatings serve to reduce friction, which, in turn, reduces the heat build-up in the blade. Too much heat in a blade promotes wear and ultimately will ruin the teeth. During the 15 years in which they have enjoyed a strong relationship with Julia, First Cut has achieved significant brand awareness and market penetration on their principal’s behalf. In addition to supplying the wide and versatile range Julia has to offer – as determined by specific customer requirements – First Cut also has a well-equipped sharpening facility at their Benrose facility, which is equipped with four CNC sharpening machines. High-quality blades from Julia can therefore be repeatedly re-sharpened to get more ‘lives’ out of each blade. As an extension of their customer service ethos, First Cut has a highly efficient blade collection and delivery service, all within exceptionally short turnaround times. Julia Utensili was founded in 1978 in Tarcento in north-eastern Italy, where it continues to produce circular saw blades. Dreossi emphasises that to maintain the high quality standards for which it is well-known, the company continues to manufacture its saw blades in Italy using high-quality steels imported from ISO 9000-approved manufacturers in Germany. “The strategic decision to produce only in Italy with German source material, has been key to our success,” asserts Dreossi. “Every one of our customers has different cutting requirements that are unique to their applications. We take pride in the fact that, through our relationship with Julia Utensili, we are able to meet – and exceed – the expectations which our customers have of these superb products,” he concludes.